May 14: Carnegie Mellon Launches Web Site For "Games With a Purpose"
For "Games With a Purpose"
PITTSBURGH—Most online game sites don't promise players anything besides some fun and a way to kill time, but a site being launched by scientists in Carnegie Mellon University's School of Computer Science will offer something else: a chance to make computers smarter. 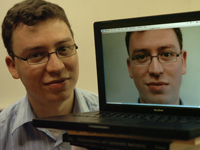 The new site, gwap.com, features what Luis von Ahn, an assistant professor in the Computer Science Department, calls "games with a purpose," or GWAPs. Each is a multi-player online game that is designed to be fun and also accomplish tasks that are easy for humans but beyond the capability of today's computers. "We have games that can help improve Internet image and audio searches, enhance artificial intelligence and teach computers to see," von Ahn said. "But that shouldn't matter to the players because it turns out these games are super fun." The site initially will feature four new games and a classic called the ESP Game. The first GWAP developed by von Ahn, the ESP Game displays images to two players who each try to guess words that the other player would use to describe the image. The game improves Web image searches by generating descriptions of uncaptioned images. Google Inc. has licensed the game, which the company calls Google Image Labeler. Squigl, a game in which players trace the outlines of objects in photographs to help teach computers to more readily recognize objects. "Putting all of these games on one site, we hope to drive up traffic by enticing players from one game to try the others," von Ahn explained. "And we're going to be adding a lot of games. We have three more that we'll be launching in the coming months." Having all of them together on the site also makes it possible for players to have a single sign-on and password, Top Player rankings and online chats, he said. In addition to von Ahn, gwap.com and the games have been developed by software engineers Mike Crawford and Edison Tan and graduate students Severin Hacker, Edith Law and Bryant Lee. Winner of a 2006 MacArthur Foundation "genius grant," von Ahn is a pioneer in the field of human computation, which uses the Internet to tap human minds to accomplish feats that still befuddle computers. As a graduate student at Carnegie Mellon, he helped develop CAPTCHAs (Completely Automated Public Turing Test to Tell Computers and Humans Apart), the distorted letter puzzles used millions of times each day worldwide to protect Web sites from computerized impostors. Last year, he introduced a new version called reCAPTCHAs, in which people solve these puzzles to gain access to a site and simultaneously help digitize old books by converting printed text into computer-readable letters. "Human computation doesn't work unless you have people," von Ahn said. "That's why we've made the games on gwap.com as fun as possible. We need people." Pictured above is Luis von Ahn.